Fifa will vote next week over whether to publicly release a disputed report into alleged corruption in the bidding for the 2018 and 2022 World Cups. World football's governing body had insisted releasing the report would not be possible for legal reasons. 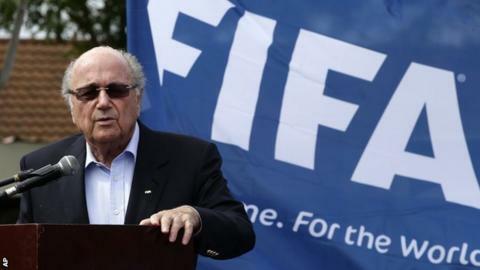 However, under a proposed amendment to Fifa's ethics code, an edited version of the report could be released. The report edits would protect the identities of witnesses who co-operated with Michael Garcia's investigation. German Theo Zwanziger, a Fifa executive committee member, has proposed that Article 36 of the governing body's ethics code, which currently prohibits the publication of the Garcia report, could be amended. Fifa are due to meet in Marrakesh, Morocco, next week where the vote will take place. Garcia, Fifa's independent ethics investigator, produced a 430-page report in September after a two-year investigation into alleged corruption. Fifa ethics judge Hans-Joachim Eckert said Garcia's report could not be made public for legal reasons and released his own report, based on Garcia's work, which cleared World Cup hosts Russia and Qatar of wrongdoing. Garcia has already appealed against Fifa's summary of his report, believing the conclusions and some of the facts to be "erroneous". Next week's vote could allow a redacted version of Garcia's report to be published.